You’ve probably noticed that I don’t use a great deal of technical terminology in my post. I want to give you the views of a simple writer’s life in Thailand through the eyes of a simple writer. I will, over time, continue to write about plants, animals and things that fascinate me—and probably show my ignorance. I hope you find it entertaining and smile from time to time. We all eat and use black pepper every day and if you are like me you don’t think much about the little peppercorns except they add flavor to a meal. 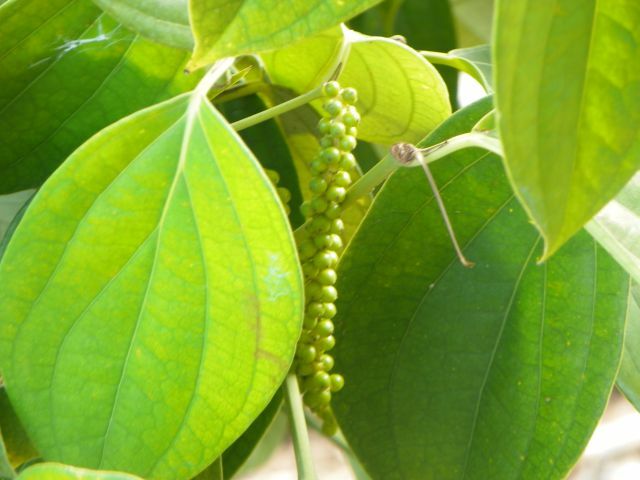 Black pepper, Piper nigrum, in not a true pepper at all. It is a vine that originally comes from the Malabar coast of India and made its way to Southeast Asia and the islands of the Pacific. At one point it was used as money in bartering other good and was worth its weight in gold. Wars, colonization, the great shipping companies are part of the results of the spices the western world found they couldn’t live without. Black pepper was among the most sought after because of its medicinal uses as well as the ability to store it for the long voyages to market. There isn’t a country or people in this world who don’t use black pepper today and we give it little thought. Exotic things have fascinated me all my life but I knew little about them. When we started our little farm here in Thailand I was in a nursery looking for different things to plant. My wife left me alone because my choices made no sense to her. I was looking at some small vines that had a cluster of berries and I asked the worker following me around what it was. She said Pic Thai, which I translated to black pepper. I didn’t believe her and was off like a flash to find my wife and drag her back. “Yes. That is a black pepper plant,” says she. I placed my order for a few black pepper, white pepper and red pepper plants. The worker looked at me like I was an idiot—I seem to get that look a lot over here—and then she began to call all the other ladies working in the nursery over to tell the what the ‘crazy white man’ wanted. They had to sit down because their laughter weakened their knees- I get that a lot too. My wife, who recognized the laughter as something I had caused came over to rescue me. I’m a very lucky man to have a woman like her! When she found out what I had ordered she began a long conversation with the ladies. Later I found out that she really didn’t know the answer to why they were laughing. Well, to make a long story short. Red pepper, white pepper and black pepper come from the same plant—do what? It really depends on how mature the fruit is. White pepper is dried black pepper with the out shell removed. Red pepper is the cluster of fruit allowed to mature to a ripe red color. Who knew? Now I’m sure there are chefs around the world that will argue with this but in Thailand that’s what it is. I’m talking about peppercorns, not the real peppers that grow on bushes. 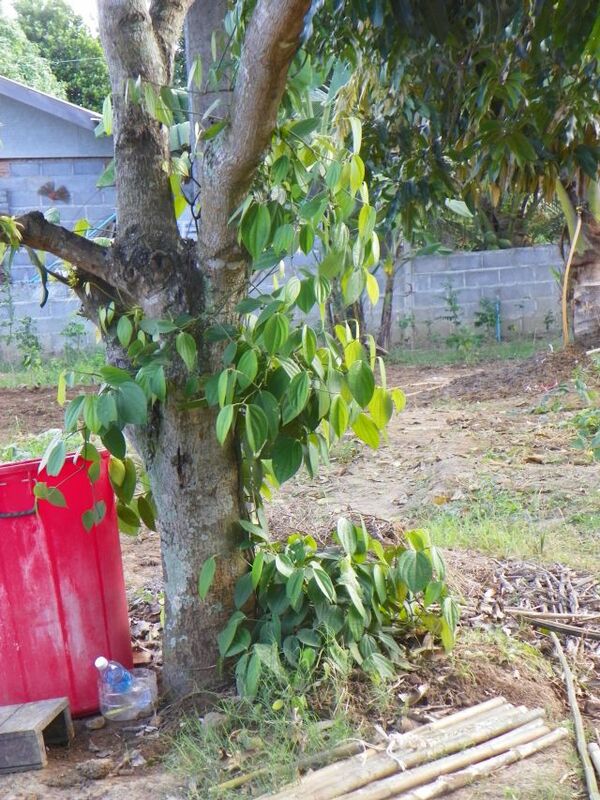 I planted my newly purchased black pepper plants so that the vines would run up the trunks of our mango trees and I checked them every day. When my wife informed me it took around three years for the vines to start producing I was devastated, but still sure I would wait. Once they start they produce for your lifetime. Some six years later I am not disappointed! While our plants aren’t the best kept—due to lack of knowledge- they are producing beautiful clusters of bright green peppercorn and I am very proud. I’ve looked all over my computer for great pictures and as usual, since I’m bad about not labeling, I haven’t found my best. One last thing about black pepper. Something I think many people don’t know. The Thais use the green clusters of fresh peppercorns in soups and other dishes and it gives the dish the ultimate pungent black pepper taste. This must come with a caveat! Biting into one of these clusters is a volatile experience. I can and do eat very spices food but I thought I was going to die the first and second time I tried to eat the green black pepper… Did he say the first and second time? Yes, once is enough for an average person to learn, but I’m far from average, LOL. I hope you enjoyed this short journey into the world of spices—I have many more experiences to share. I have people reading my little blog from every continent—except Antarctica and there’s always hope someone with nothing else to do on Antarctica will take a look. It’s still a wonder to me that people read about my life in Thailand but I am forever grateful! For those who have been following the floods in Thailand. We are back in Bangkok and cleaning up. I worked for three days on my motorcycle and it lives! I have decided to name her, Phoenix. In the spirit of Christmas I’ve added two pictures. 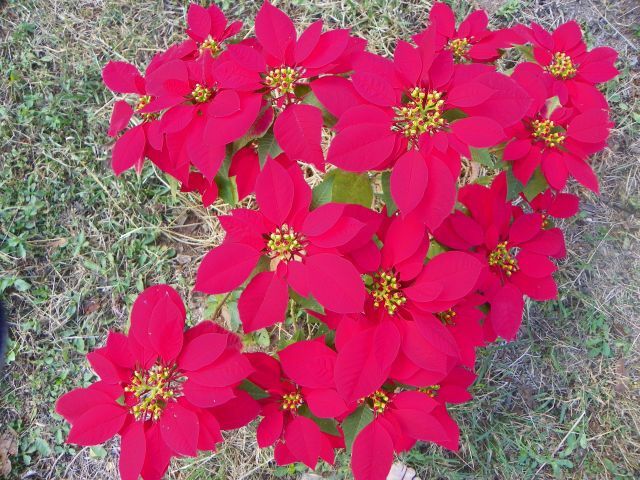 One is of a poinsettia plant on our little farm. The Thai name is ‘Christmas’. 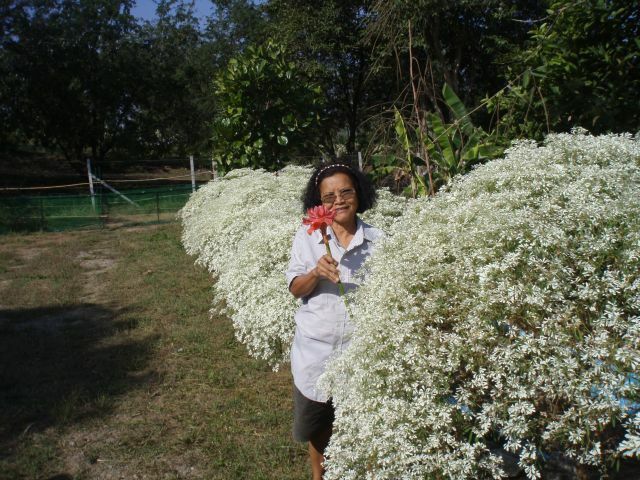 Also a picture of ‘White Christmas’– The Thai name– bushes that turn a snowy white in December. Merry Christmas everyone! I am a writer, author and blog about living in Thailand and other musings. Have you ever dreamed of living in a foreign, exotic place?